Halloween is almost here, and in true spirit of the festivity’s awesome spookiness, we have sourced some of the scariest nail art around. Take a look at some of the spookiest Halloween nails that are guaranteed to give your chosen outfit a fun, and scary-as-hell finish. Frighten the socks off your party guests with these awesome blood nails. For any wannabe vampires or horror movie addicts, this Dracula themed nail art design will make the perfect impression. Nothing says scary as hell as weird little gnomes. Although these frightening little critters are sometime overlooked in favour of the skeleton or ghoul, wearing this design is not just original but will pack a punch at any party. This nail design incorporates just about everything you can think of. Spooky cats, graveyards, ghosts, trees, pumpkins, and witches! When you can’t decide, choose everything! Choose this design for a great and ghostly finish to a glam outfit; a mix of purple sparkles and spooky ghosts, the nail art is pretty scary! These glow-up in the dark spooks are an excellent creation, which will keep you looking glam and spooky all night long. Are you looking for a cute and fun nail design for this October 31st? If so, you’ve come to the right (haunted) place. With the haunted house on one hand and a creepy cobweb on the other, these nails tick all 3 boxes: cute, fun, and frightening! 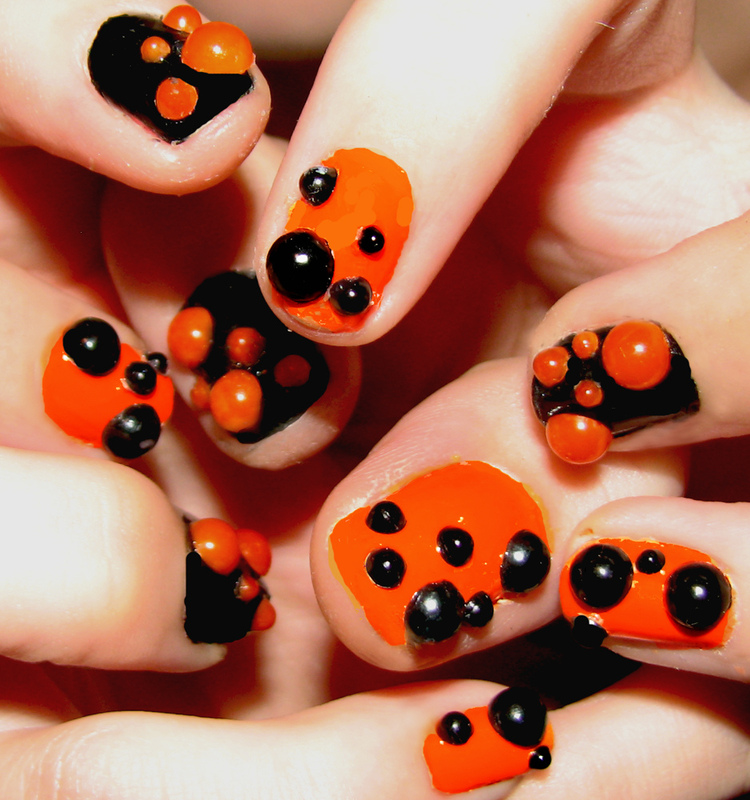 Be bang on trend by incorporating bubble nail art with Halloween. The orange and black bubble spots will compliment the spookiest of costumes.